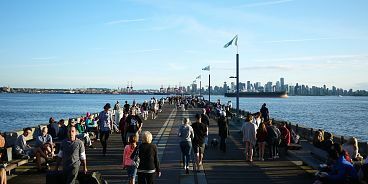 Over the past couple of years, the North Vancouver Shipyards Night Market has grown from a small festival to the place to be on Friday nights. It’s even an option for downtowners who can easily hop on the sea bus for a 15 minute commute. Lined up near the pier, you’ll find about 20 food trucks, slews of artisan food producers, and other vendors selling odds and ends. There’s ice cream, vegan food, baked goods, falafel, indian, guatemalan, even good iced coffee from jamaican blue cold brew. There really is something for everyone. When I recently went there was a magic show happening on the pier (perfect for kids), live music from the Adam Woodall Band (each week new local talent is showcased), and a beer and wine garden packed with a young crowd. You can even bring your dog. The Shipyards Night Market happens every Friday of the summer until September 26th, from 5 – 10pm. You must get down there at least once this summer.